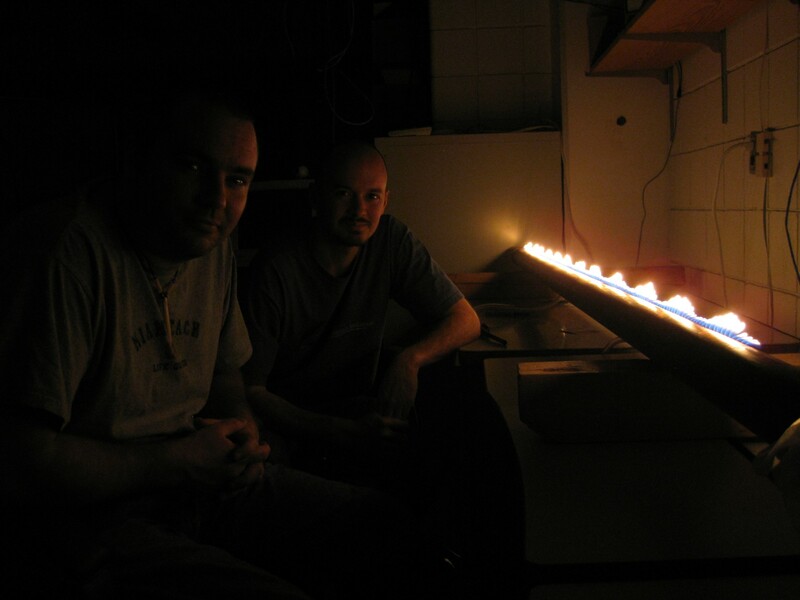 Roy Montalvo and I made a Rubens Tube for the 2010 Texas A&M Physics Festival. We will be demonstrating it to students over a wide range of ages, from elementary to college level. 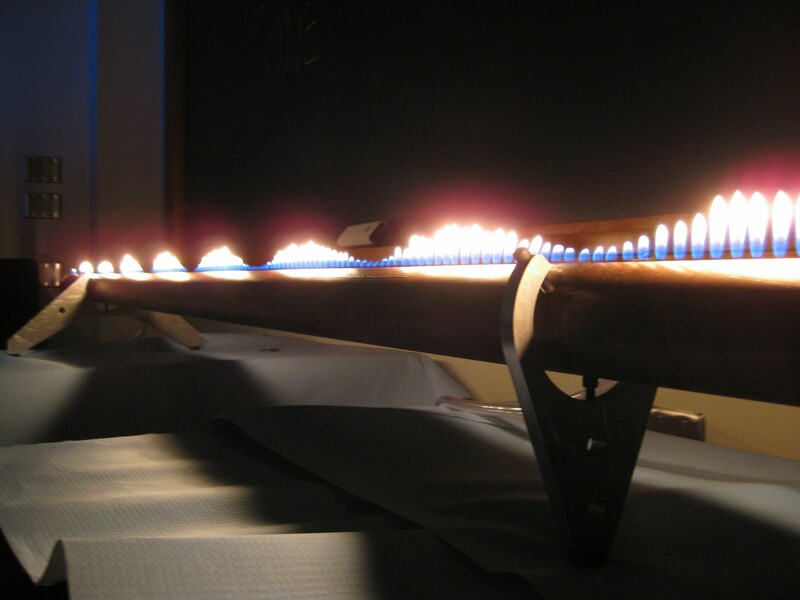 What is a Rubens Tube? A Ruben’s Tube is a long metal tube with small holes drilled along its length. A speaker or signal generator is mounted in one end and the other end is capped. 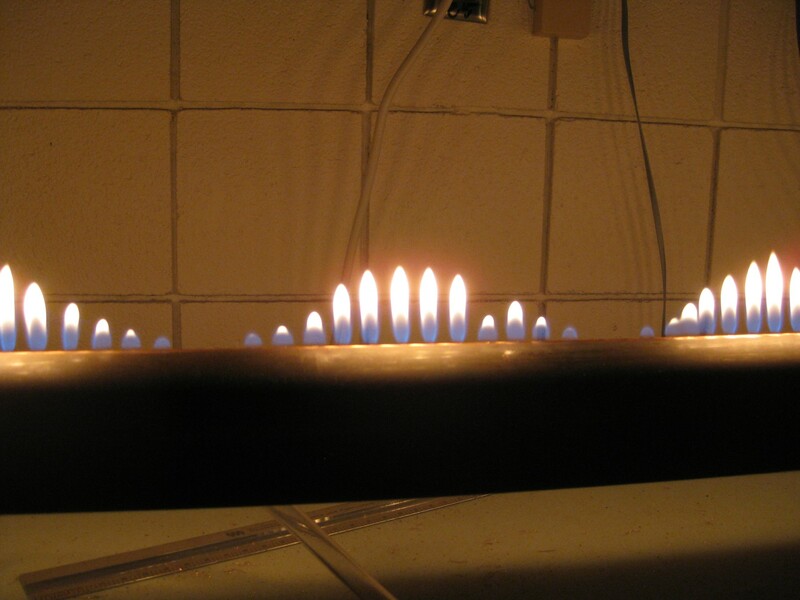 Propane is fed into the tube and the small holes are lit on fire. Sound is a pressure wave, so as it moves through a gas it alternately compresses and expands the gas in different regions. When a constant tone at one of a set of particular frequencies is sent through the speaker, a standing wave can form. 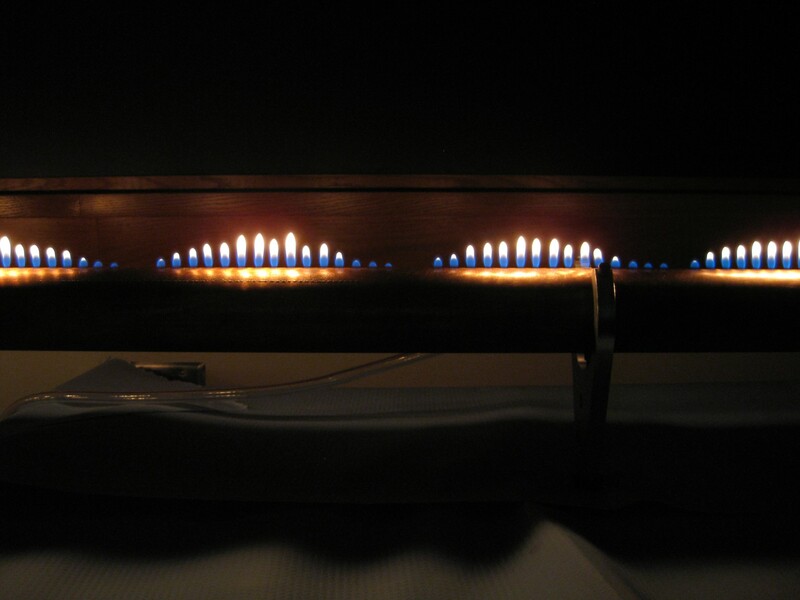 A standing wave causes areas of high pressure to appear at fixed points along the pipe, spaced half-wavelengths apart. 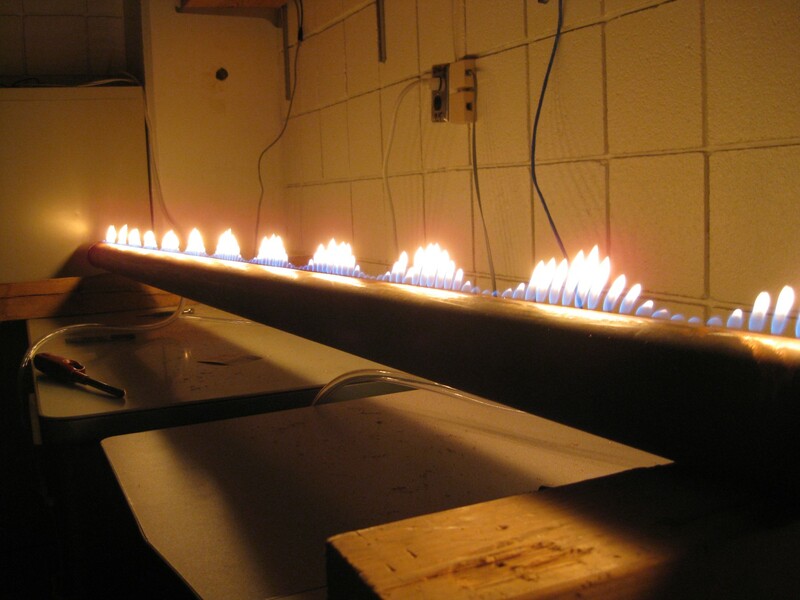 Where the pressure is high, the propane is driven more strongly out of the pipe, resulting in a tall flame. Between these high-pressure points will be low-pressure points, which create lower flames. When we first constructed the tube we were worried about having too little gas flow, so we drilled the holes along the top of the pipe every inch. With the holes spaced this far apart we found that an individual hole, if the flame was extinguished, would take a long time to relight from its neighbors. This was a serious problem since we wanted to be able to rapidly change the tones, so we reduced the spacing to half an inch and found that to work well. Any closer than a half inch and the flames tended to merge together. We soldered fittings onto the side of the pipe at each end for the propane lines. Most of the Rubens Tubes I’ve seen use the end opposing the speaker as the gas inlet, but having an inlet on each end would have the propane more evenly distributed over the length of the pipe. We capped one end of the pipe and closed off the other with a stretched latex membrane (a surgical glove). We decided to use a membrane and an external speaker rather than seal a speaker inside the tube because we wanted to be able to show how simple the device really is. 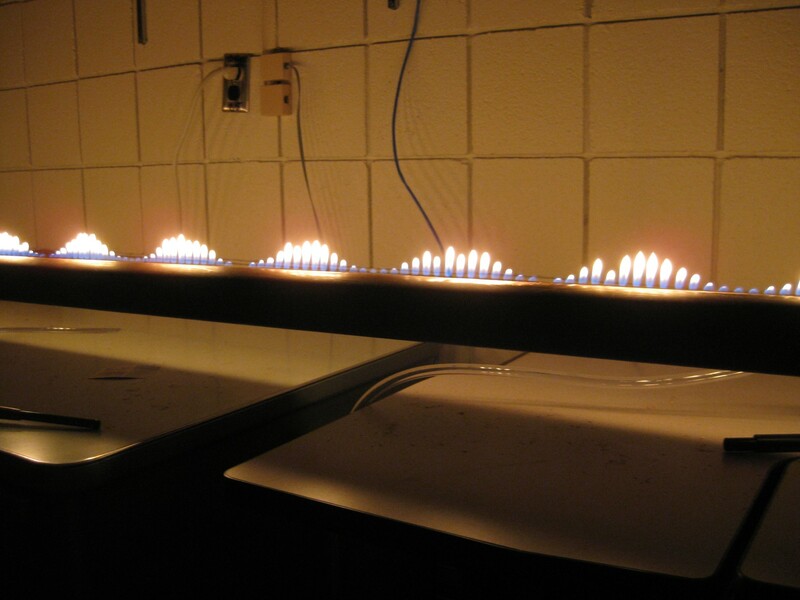 During the demonstration we can show that the sound is the only cause of the flame crests by simply removing the speaker and watching the pattern disappear. Another nice thing about having a removable speaker is that you can show that other sources of sound can also generate a standing wave. We discovered that simply shouting into the tube with the proper frequency would generate nice waves and was entertaining to the audience. We also connected a piano keyboard to the speaker (with a long speaker cable) and allowed the audience to play notes and melodies on the keyboard to see different standing waves appear. My friend posted a video that details the construction a bit more. 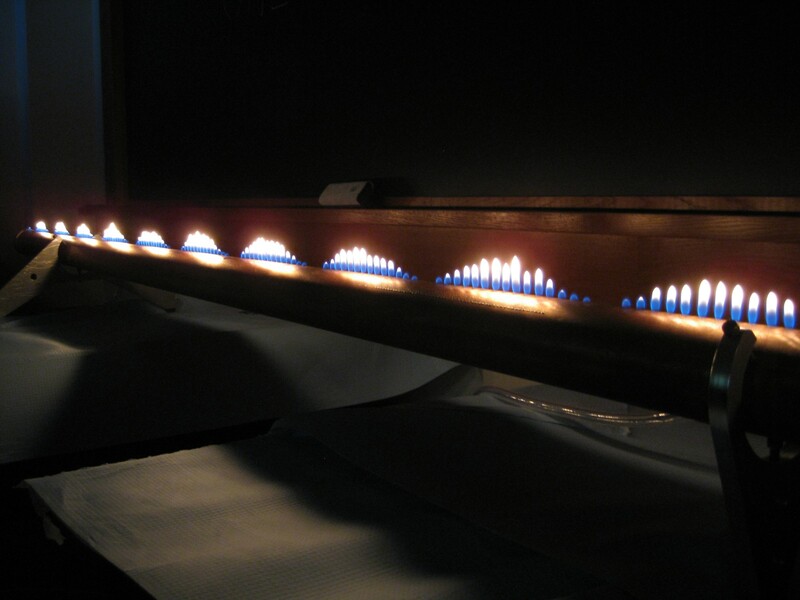 It also shows the tube running under several different frequencies and even to some actual music. Jump to 4:30 in the video to see how the tube responds to various frequencies and songs. 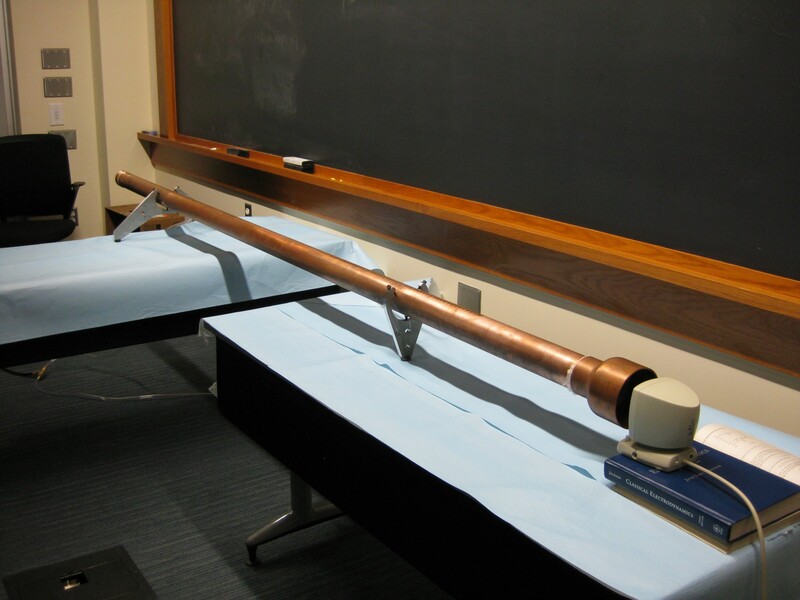 The pictures below show the construction and a particular standing wave (750 Hz) inside the tube.